Last week the Science in Mind blog on my local Boston.com website ran an interesting story that is definitely worthy of reflection. It involves 2 local hospitals that are carrying out a project funded by the National Institute of Health (USA). 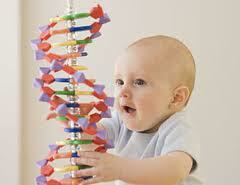 The projects involve sequencing the DNA of newly born babies over the next 5 years. Read all about it here. Now sequencing the DNA of babies carries with it several risks and ethical concerns, as well as well argued benefits. If we take the benefits first, doctors may gain information about a baby, such as high risk for a certain disease, genetic mutations that may require changes of lifestyle etc. They might also find explanations for problems that might otherwise go undetected. There are though as I say risks and concerns. How will parents react if they discover that their baby has a high risk of an incurable disease? How will the knowledge gained through the test effect the way the parents view and behave towards their children? Are we giving families information that will change their understanding of parenting to such a degree that it might destroy the very fabric of their social relationships? This is not to mention the social implications of giving out such information regarding extended family. If for example I am told that my baby has a genetic mutation carried by the parents that might have a serious effect on its life, should I tell my brothers and cousins so that they can screen their prospective wives, make decisions about having children or even worse a pregnancy already in course? And not to mention the obvious problem of discovering that the father is not the man stood in the room with the mother. These problems are in fact the issues that the researchers running the project are hoping to look into. The question is if the clinical benefits outweigh the risks of such an approach. In June of last year I wrote a post here on Technology Bloggers called Sequencing the Genome of Unborn Babies. I also raised a lot of similar ethical concerns in May of the same year in Home Genetic Testing, Pros and Cons. On the Bassetti Foundation we find DNA Privacy Issues from January of this year, a series called Architectures for Life from 2012 and a review of a book called Go Ask Your Father, just for starters. My own personal view is that much of the promise peddled to us surrounding medicine and the sequencing of the human genome has yet to be delivered. One problem is money. Personalized medicine sounds like a great idea. I get my genome sequenced, we can see which drugs might work the best, the type of treatment I need etc. But drug companies cannot make, test and market a drug especially for me even with all of this information, it is just not cost effective. They want big sellers, generic medicines that work to some extent on everybody, not something that is fantastic for me with my particular gene pool. There are clinical benefits, I am not arguing otherwise, but we must wait to see how great. Humanity seems to be striving to make everything easier and everyone perfect. I do wonder what that sort world would be like to live in… my guess is pretty boring and repetitive.